Football fans are vying to reach Brazil in the closest time possible to catch up the maximum 2014 FIFA World Cup excitement. But the MINI of UK wants the football buffs to take a halt in its Kingdom, before landing onto the football mad country, and see its Cooper Paceman GoalCooper edition which it is has especially revealed for them. 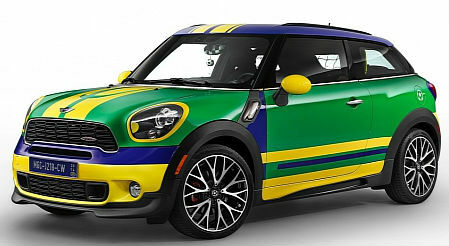 On the outer, the car is draped in the flag color of host country Brazil, with a twist of lime yellow blended aptly in the contour of green. On inside, the floodlights and the AstroTurf carpeting throughout are giving it a feel of the football stadium. The model has a miniature table football game and an iPad holder. For further excitement, the seats at rear can be folded down completely allowing access to the net which can be used as a goal post for practicing the game anywhere. More to the fun, for those who always prefer professionalism, there is also a goalkeeper to it, which does its job dutifully everytime. Needed not to drool of any robots popping up from the rear seat, instead the Park Distance Control sensors closes the tailgate when a shot is taken towards the goal. So, who wanted to experience the penalty shootout can buy this car, and can take it alone to the practice, escalating the need of any other player to help him in gaining the penalty perfection!